What’s the Difference Between a Conventional Water Heater and Tankless Water Heater? As you prepare yourself for a new water heater, it may be worth considering the different options for the type of water heater you should get. The two main types of water heaters available are tankless and conventional. So what’s the difference, and which is right for your home? Conventional water heaters store and preheat 30+ gallons of water so that it’s ready for you at all times. A tankless water heater works by heating water whenever you’re using hot water, and doesn’t use a storage reservoir. Conventional water heaters are built to have hot water wherever you need them, and they take a significant amount of water before you’ll notice losing some hot water. If you have a family, or would like the convenience of running a washer, dishwasher and shower at the same time, conventional water heaters are the perfect choice. 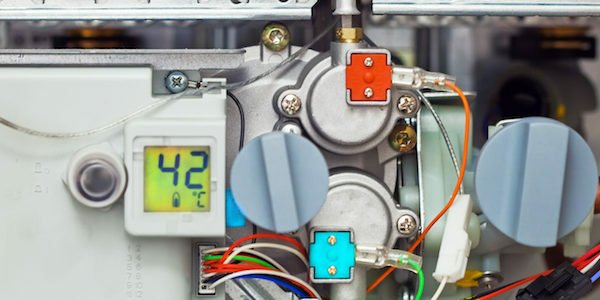 Conventional water heaters are also easier on the wallet in most instances up-front, and technological advancements have made them more eco-friendly than ever before. Even the most durable water heaters can only last so long, even when lightly used and well maintained. A typical water heater lasts about 10-15 years in a normal sized home, which is less than the 20+ year life of a tankless water heater. Although the reservoir may take some time to deplete, if you’re the last person to shower in a family quickly rushing to get ready to go out, you might experience a loss of hot water. The reservoirs take a bit of time to refill and reheat the water, unlike tankless systems. Conventional water heaters are also significantly larger than tankless water heaters. If space is an issue in your home, this could be a large factor. Smaller buildings, homes, condos and apartments may have need for as much space as available, tankless may be a better option. If size is a factor, tankless water heaters come in at a fraction of the size of conventional water heaters. Small enough to mount in even a small bathroom closet, tankless water heaters remain out of sight. Tankless water heaters also last 20+ years on average, because they only need to be on and running when hot water is needed. If you live without high volume water needs, tankless water heaters are also typically more energy efficient, and can save you more money in the long run than a conventional water heater. The largest disadvantage of tankless water heaters is that they cost a bit more up front, both for the unit itself, and often for the installation if you’re switching to tankless from a conventional water heater. Tankless water heaters often make up for the cost with much better energy efficiency. If you’re not sure which water heater would work best for your home, that’s no problem. Different homes have different needs, and the only time most homeowners think about their water heaters is when they need to be repaired or replaced. Luckily the experts at Greenwave Plumbing have over 40 years of combined experience working with water heaters. Contact a licensed plumber today to schedule a consultation and find out which water heater would be best for your home.